...more bonsai than giant redwood. Fresh wood is one of those smells, like fresh-baked cookies or fresh-cut grass, that no one doesn't like. And Comme des Garçons, for all of their squid-ink-this and ozone-that perfumes, are plenty happy to give the people what they like. Comme des Garçons teased the sweet tooth with their Series 7: Sweet (Sticky Cake, Burnt Sugar, etc) and rolled in the hay with their Series 1: Leaves (Calamus, Shiso, etc). And between Hinoki,﻿ Palisander, Standard, Dover St Market and now Wonderwood, CdG have really done a run on the lumberyard. As much as I love bark, twigs, sap and sawdust in my perfumes, I must confess to experiencing a little wood fatigue after years of CdG's non-stop log-loading. Wonderwood is so easy to wear, and not demanding in any way, but maybe I just need a break from the Forestry Service. In other words, it's not you, WW, it's me. “Am wearing Wonderwood right now, but am not sure I like as much as Tom Ford. I have asked around the office but comments are mixed -- it's 'a bit teenage boy', 'a bit like Axe', and a bit 'subtle' or 'peppery', but people do seem to like it. The bottle is v. annoying though and can't stand up!" Sigh. These newbies and their lack of enthusiasm for arty packaging! I wish I smelled like a cabinet when I wear Wonderwood. For me, it's surprisingly timid. I smell like a room where a cabinet used to be. Or a room next to a room with a cabinet. Or the memory of a cabinet. Or a tiny little dollhouse cabinet. It's all wood, but more bonsai than giant redwood. Well, I think that WW is the posh version of Marc Jacobs Bang. To my nose, the recipe for Bang seems to be: take a cup of black pepper, a cup of cedar chips, and stir. Then wait for your nose to explode. By contrast, Wonderwood finesses the black pepper and cedar and whips it into a soft, woody souffle. A souffle of bonsai proportions, but what's so bad about small? It's better than an exploded nose. I am so jealous of your Bang exploded nose! It mews for only about an hour on me but only if I sit real still and tilt my chin in the direction of things I want people to bring me, like some sort of frigid ...paralyzed queen. Don't you think WW is too nice? I'd love an aggressive, thrashing, kind of haunted wood. I don't want to smell like a tree. There. I said it. But I really don't want to smell like a fake tree. 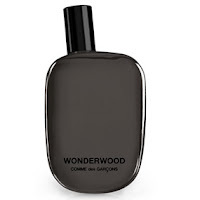 And Wonderwood smells like some synthetic-woody-chemical mashup of a fragrance to me. With sharp plastic needles that sort of pierce my nose. And then turn sour. A fake Bonzai? Depressing. I only tried WW once and I quickly scrubbed it. Which could say something about my memory also being a little, well, fake. Well, I get the Pepper blast. Anything else not really. It last like nanoseconds on me. Its a jumbled mess. Not original and too clean smelling. I was expecting so much more from it, maybe that is my problem with it. Not complex enough. Haha rekoob: "frigid...paralyzed queen". Yes, WW is nice, perhaps too nice. I do love the idea of thrashing haunted wood. Maybe that's Le Labo Oud 27? m61, you're making WW sound like a Radiohead song: "Fake Plastic Trees". Gojira, the longevity complaints are rolling in. I'm with the others here - I find WV and Bang rather light and chemical, sort of "turbosport azure wood". Nonetheless, a step up from the standard sporty. I recently smelled some aged cambodian oudh, and that's definitely the thrashing thing rekoob wants. It comes complete of the whole cabinet apparatus Dan likes, fresh varnish turpentine smell and all. cacio, I always marvel how oud can smell like not only wood, but the lacquer that glosses it and the polish that shines it. I really liked Wonderwood! One of my favorite CdG scents!